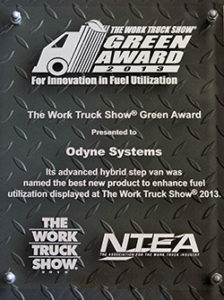 Odyne Receives 2013 NTEA Work Truck Show Green Award for Unique New Walk-In Van Hybrid Power Application. Waukesha, WI, April 2, 2013 – Odyne Systems, LLC has won The Work Truck Show® 2013 Green Award for an advanced hybrid commercial vehicle it developed with ComEd (Chicago, IL). The Work Truck Show 2013, held March 6−8 at the Indiana Convention Center in Indianapolis, IN, showcased the latest commercially viable hybrid and alternative fuel vehicles. Odyne used the event to introduce a unique walk-in van equipped with a plug-in hybrid system providing electrical power from a large advanced battery system. The batteries can be recharged for uninterrupted extended operations at the work site by the chassis engine, or through cleaner energy from the grid. The new hybrid system provides benefits during driving and stationary operations by reducing fuel consumption, emissions and work site noise. 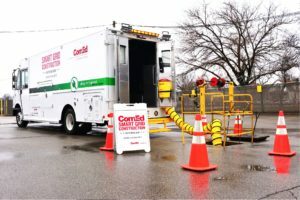 Designed for ComEd’s underground electrical maintenance work in Chicago, the van is built on a chassis from Freightliner Custom Chassis utilizing a Utilimaster walk-in van body and Team Fenex manhole air delivery system. The vehicle can be parked above a manhole to provide workers below with all their electrical needs, plus cooled or heated fresh air. The system significantly reduces chassis engine idling and delivers over 14 kW of power for tools and other applications without the need for a separate diesel generator. The Odyne system utilizes an Allison 2000 series fully automatic transmission, Remy electric motor and Johnson Controls lithium-ion battery packs. When the van is being driven, hybrid components provide launch assist and regenerative braking, for improved performance and higher efficiency. The Odyne plug-in hybrid system is the only hybrid electric system designed to operate with an Allison 2000 series transmission. Its parallel hybrid configuration interfaces with the vehicle’s existing drivetrain, allowing for cost-effective installation while fully retaining the transmission warranty. The Green Award is presented annually to the Work Truck Show product that best advances work truck fuel utilization as determined by a panel of trade media editors and fleet managers. Odyne is a leader in hybrid drive systems for medium and heavy-duty vehicles. Odyne’s advanced plug-in hybrid technology enables trucks over 14,000 pounds to have substantially lower fuel consumption, lower emissions, improved performance, quieter job site operation and reduced operating and maintenance costs. Odyne has fielded more plug-in hybrid trucks to fleets throughout the United States than any other supplier. The company sells its unique modular hybrid system for new and retrofit applications direct to truck manufacturers and through a global distribution and service network. The name Odyne represents the combination of “O” for Optimal and “dyne” for power or force. Odyne’s hybrid system for medium and heavy-duty trucks represents the best hybrid power solution for large trucks. For further information, visit us at www.odyne.com. and follow us on Twitter @Odyne. Allison Transmission is the world’s largest manufacturer of fully-automatic transmissions for medium- and heavy-duty commercial vehicles, medium- and heavy-tactical U.S. military vehicles and hybrid-propulsion systems for transit buses. Allison transmissions are used in a variety of applications including on-highway trucks (distribution, refuse, construction, fire and emergency), buses (primarily school and transit), motor homes, off-highway vehicles and equipment (primarily energy and mining) and military vehicles (wheeled and tracked). Founded in 1915, the Allison business is headquartered in Indianapolis, Indiana, U.S.A. and employs approximately 2,800 people. Allison has manufacturing facilities and customization centers located in China, The Netherlands, Brazil, India and Hungary. With a global presence, serving customers in North America, Europe, Asia, Australia, South America, and Africa, Allison also has approximately 1,400 independent distributor and dealer locations worldwide. More information about Allison is available at www.allisontransmission.com. Established in 1964, NTEA, the Association for the Work Truck Industry, represents more than 1,550 companies that manufacture, distribute, install, sell and repair commercial trucks, truck bodies, truck equipment, trailers and accessories. Buyers of work trucks and the major commercial truck chassis manufacturers also belong to the Association. NTEA provides in-depth technical information, education, and member programs and services, and produces The Work Truck Show. The Association maintains its administrative headquarters in suburban Detroit and a government relations office in Washington, DC.